The CIA's most lethal former operative, Jason Bourne (Matt Damon), is told that he's no longer useful to the Secret Special Forces unit. He remembers everything that's happened to him in the past few years, but as Nicky (Julia Stiles) tells him, that doesn't mean he knows everything. 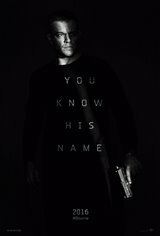 Both of them are on the run in this new installment, which will bring them to Athens and the Vegas strip and across the paths of a cyberspecialist (Alicia Vikander), a tough CIA agent (Tommy Lee Jones) who warns Bourne he'll never find any peace until he finds out who he is - and a villain (Vincent Cassel). Based on a series of bestselling novels by author Robert Ludlum, in which Jason Bourne is the protagonist.